With Patrick Mahomes the talk of the NFL, the league’s TV partners would dearly love to show every Chiefs games on national prime-time television. But that won’t happen because of the league’s TV rules. 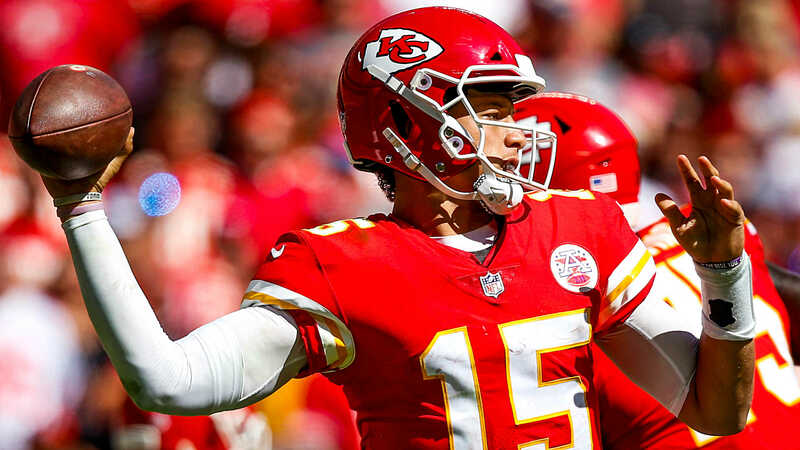 With the NFL flexing Chiefs-Bengals into NBC’s “Sunday Night Football” for Week 7, Mahome’s high-flying Chiefs have reached their maximum amount of six scheduled prime-time games per season. That’s bad news for national TV viewers fascinated by the gunslinging Mahomes and high-flying 5-1 Chiefs, who lost a 43-40 shootout to Tom Brady and the Patriots at Gillette Stadium on Sunday night. But it’s good news for Chiefs fans, who’ll be able to enjoy more traditional Sunday afternoon games. The Chiefs were originally supposed to kick off against the 4-2 Bengals at 1 p.m. on Oct. 21. But TV viewers can’t get enough of the 23-year-old Mahomes, who leads the NFL with 18 touchdown passes. So the NFL decided to showcase its young superstar for two weeks in a row on “Sunday Night Football,” the No. 1 show on all prime-time TV for the past seven seasons. As a result, the previously scheduled Rams-49ers game was moved from NBC’s prime-time slot to a 4:25 p.m. ET kick on CBS. It will be hard to top Sunday night’s thrilling showdown between the young Mahomes and 41-year-old Brady. But ESPN’s “Monday Night Football” has what could be the game of the year, between Mahomes’ Chiefs and the 6-0 Rams on Nov. 19 from Mexico City. In its first year of “Thursday Night Football” coverage, Fox/NFL Network will show Chiefs-Chargers on Dec. 13. The son of an MLB pitcher, Mahomes has always had a live arm. When Mahomes was a Little Leaguer, his dad had to move him away from shortstop because his rifle throws would hurt his team’s first basemen. During an interview with NBC’s Michele Tafoya on Sunday night, Mahomes estimated he can throw a football 85 yards in the air. Easily. “I’m never scared to throw the ball deep,” he said. That Brett Favre-like bravado makes him a natural for TV stardom. No wonder they call Mahomes Showtime.